I shared this on Facebook first, but I know we have followers that opt out of social media (we totally get it!). This should be short and amusing (Danny DeVito?) at least we thought it was funny. 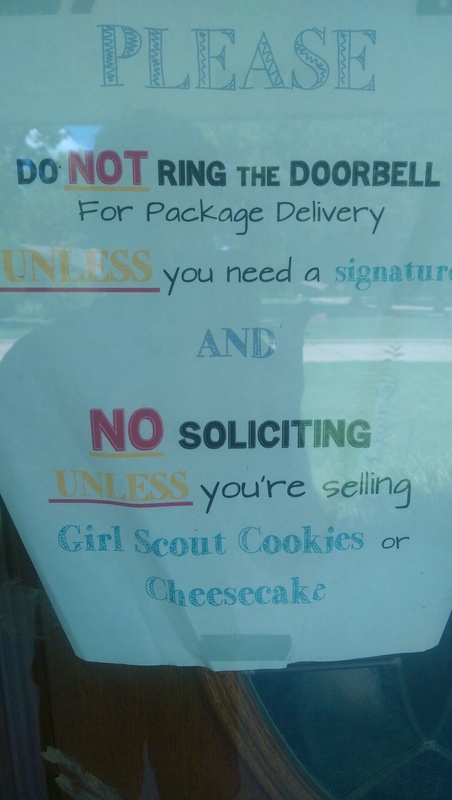 We have a sign posted on our door out front (I’ll do my best to include it in the post) that requests no knocking or ringing of the doorbell unless you NEED a person to sign for a delivery, or what have you… otherwise, we’re probably not interested. Honestly, it’s not 1987. Even if you want to drop by at a moment’s notice (I have no idea why you would? We’re horrible…) I’ll bet you have a phone in your hand and can text us. Today, we get a knock at the door. Dad Looks through a kitchen window and sees a person we don’t know. They’re not a delivery person or a postal carrier; we’re sure they SAW the sign, right? Dad decides to answer amidst Wednesday barking her fool head off. I’m sure we covered this, but she has limited sight. She gets anxious around new people, and for some reason, the front door is a trigger we’re working on eliminating. So, Dad stepped out to talk with her. Now she looks as puzzled as Dad. See the Doctor’s office called Dad last week and said they found someone that may help us, and she was going to send along medical history and have the trainer contact Dad so we could schedule a meeting to see if we could work together. Having a PT show up at the house looking to work with you is convenient, but odd. In our experience, mid-westerners are nice, but not nice enough to come to you unannounced expecting to fix ya right up! (We do have a lot of door to door salespeople here… that’s also odd to us, but another story altogether.) Did she just know there is someone in this house that desperately needs PT? If she did, that’s pretty cool! Uh, Yeah… you too! – BYE Felicia!